This method has served me well for a number of years and through a number of projects, though I did eventually change my pen of choice (to a fountain pen and liquid ink). But gradually– whether through inattention to detail, being able to devote less time to my art and thus rushing through it, or something else entirely– I became increasingly unhappy with not the concept of hand lettering, but with my execution of it … which is why earlier this year I began experimenting with typeset lettering in my Watusi strip. 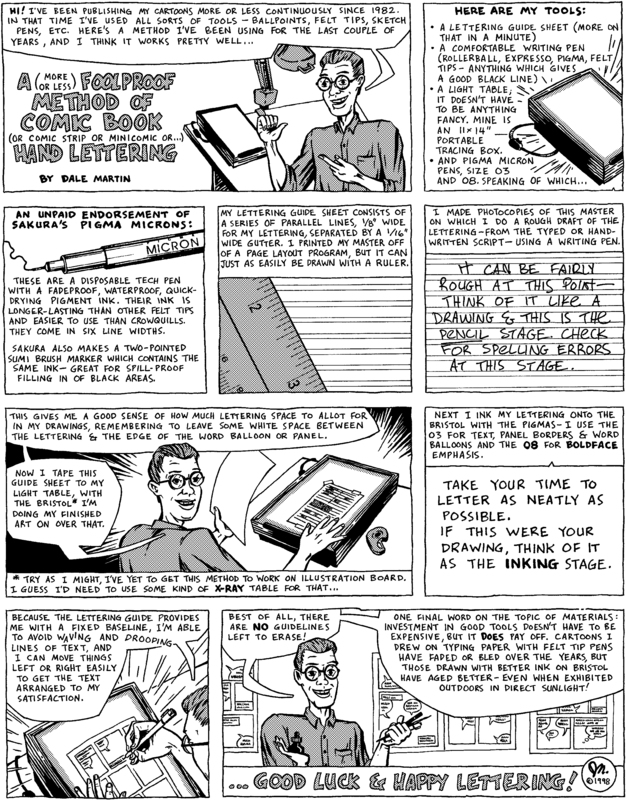 Hans Presto made this page dedicated to comic book lettering, including lots of technical and theoretical info for both hand and computer methods. Also features a great essay on “The underappreciated art of lettering” by Augie De Blieck Jr. (from CBR, Dec.1999). Todd Klein may be one of the most well-known letterers around; here’s his history of his career in lettering. Ken Bruzenak was the letterer of Howard Chaykin’s groundbreaking American Flagg! series. Catch this podcast interview with him on Sidebar. Balloon Tales is Comicraft’s online guide to comic lettering and production! Blambot’s Nate Piekos writes about some of the grammatical and aesthetic traditions unique to comic book lettering. I still letter my strips by hand– to give enough space for my lettering– then tidy it up on the scan using my custom font. It’s important for me to allot enough room in my composition for the words, but the font certainly improves readability … especially since my lettering has gotten rougher since I know it’s just a placeholder in the art!